This paper describes the design and ecologically valid evaluation of a learner model that lies at the heart of an intelligent learning environment called iTalk2Learn. A core objective of the learner model is to adapt formative feedback based on students’ affective states. Types of adaptation include what type of formative feedback should be provided and how it should be presented. Two Bayesian networks trained with data gathered in a series of Wizard-of-Oz studies are used for the adaptation process. 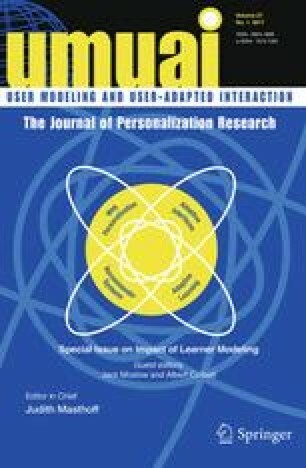 This paper reports results from a quasi-experimental evaluation, in authentic classroom settings, which compared a version of iTalk2Learn that adapted feedback based on students’ affective states as they were talking aloud with the system (the affect condition) with one that provided feedback based only on the students’ performance (the non-affect condition). Our results suggest that affect-aware support contributes to reducing boredom and off-task behavior, and may have an effect on learning. We discuss the internal and ecological validity of the study, in light of pedagogical considerations that informed the design of the two conditions. Overall, the results of the study have implications both for the design of educational technology and for classroom approaches to teaching, because they highlight the important role that affect-aware modelling plays in the adaptive delivery of formative feedback to support learning. This research received funding from the European Union Seventh Framework Programme (FP7/2007–2013) under Grant Agreement No. 318051—iTalk2Learn project. Thanks to all our iTalk2Learn colleagues for their support and ideas.